When I first visited Albania in November 2011 I hadn’t been there too long before I realised a number of things about the monuments that had been constructed during the socialist period (1944-1990). The first was that there were a lot of them – at that time I didn’t realise just how many. Secondly, that some of them were quite remarkable, and unique, examples of Socialist Realist Art and, thirdly, they were all in danger, whether it be through ignorance, simple neglect or vandalism – be it ‘official’ (as an expression of political hatred, as has already happened in a number of cases, such as the Five Heroes of Vig in Shkoder and more recently The Four Heroines in Mirdita) or ‘unofficial’ – some people destroy because they are themselves unable to create. By the time I had come to the end of that first visit I had decided that I would embark on a ‘one man crusade’ to record these monuments before a unique art form was lost forever. On subsequent visits I slowly ‘collected’ more and more monuments but this was achieved on a very much ‘hit and miss’ approach. I might come across a snippet of information here or (more often or not) would just come across a location by chance as I travelled around the country. I soon realised that this approach was far too random and as I learnt that there were hundreds of monuments such a way of working would take more years than I have left on the planet. Limited knowledge of the Albanian language didn’t help and when avenues seemed to open up they very often led to a dead-end or of limited practical use. If people had the information they sometimes wanted to keep it to themselves (a few perhaps thinking it had commercial potential, others that it might incur the wrath of their political paymasters). Whatever the reason the obstacles became greater the more I investigated the matter. That all changed, immeasurably for the better, at the end of 2014 when, by mere chance, I came across the Department of Eagles website and learnt that earlier that very year they had been working on a project to quantify the ‘lapidars’ (as I came to realise these monuments were called in Albania) and that their report would be made available online at the beginning of 2015. There was a slight delay in publication but when they were available on the web they answered many (unfortunately not all) of my questions. Volume One consists of an introduction to the project, a number of articles (both contemporary and historic) about the ideology behind their construction and comments on some specific examples – ‘Mother Albania’ and ‘Comrades’ – as well as a list of all the identified lapidars, giving a GPS location, altitude, any inscriptions, further relevant information, such as sculptor or date of inauguration, and reference to images in one of the other volumes. Volume Two and Volume Three contain, normally, two images of each lapidar recorded, irrespective of their artistic merit. One of the principles that underlay the project was to treat ALL the lapidars as of equal merit. Although not exclusively Volume Two contains images from north of Tirana, Volume Three from south of the capital. (Tirana is, more or less, at the half way point between the most northerly and southerly points of the country.) These three volumes are available as a pdf download. The work of Vincent, Marco and Xheni (carried out over 50 days, travelling 7547 kilometres, recording 657 monuments and taking 53427 photos) cannot be praised enough. Whatever the ultimate fate of those hundreds of unique and (sometimes) remarkable pieces of history at least they have been recorded for posterity and will offer those – both Albanians and any others with an interest in Albania’s first effort to construct socialism – in the future an opportunity to study the past based upon real and ‘concrete’ material. However extensive the Albanian Lapidar Survey (ALS) it had its limitations, established before they set out on their long road trip. Bas Reliefs on buildings, cultural statues (both often on or near Palaces of Culture), statues or busts of the hundreds of Peoples’ Heroes and Heroines, as well as wall plaques commemorating specific events or the participation of a family member in the Anti-Fascist War for National Liberation, were not included in the study. To have done so would have doubled the work but time and finance did not allow for such extra investigation. That means that although the ALS has accumulated a vast amount of invaluable information the task has not yet been completed. As well as not covering all examples of public art and memorials (and not even considering registering the whereabouts and details of the hundreds of paintings produced in the period) the survey restricted itself to quantifying the lapidars and didn’t even touch upon the stories that these monuments represented. 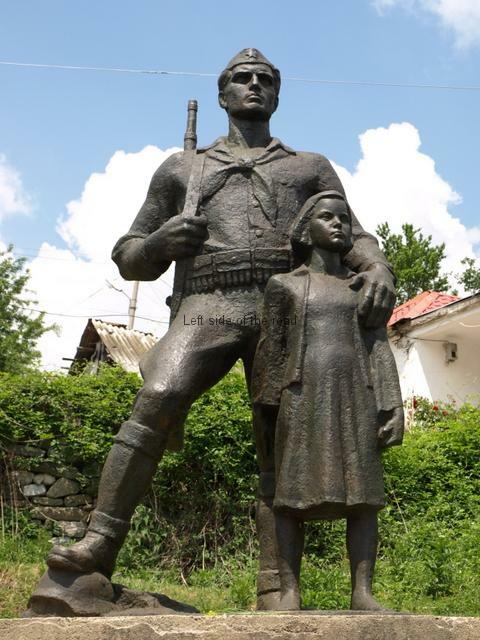 The Socialist Realist idea that is seen in Albania cannot be taken out of context. The location, the year of inauguration, what was depicted, how it is depicted, the materials used, etc., are all part of the story of the construction of socialism. Socialist Realist art, it all its forms, is openly propagandistic. It is considered to be part of the struggle against the old ideas of the past. By commemorating the self-sacrifice and heroism of those who fought for the liberation of their country, from first Italian and then German Fascism, the state had a dual aim. First was to remember the bravery and the reasons why those communists (although not exclusively communists) had fought, not just against a foreign invader but also for the future in which they believed the country and its people could go forward in a different way from what had been the fate of working people and peasants in past centuries. Secondly, by remembering and commemorating those who had died in the past the aim was to instil in the young and those to be born that socialism is not easy to achieve, that capitalism/imperialism will do its utmost to destroy any attempt of the working class to liberate itself from the shackles of oppression and exploitation, and that further sacrifices would almost certainly be needed in the future. It was due to the opposition to those ideas that, once given free rein, the reactionaries – that exist and will exist within all socialist societies for a long time after a revolution has taken place – destroyed (and are still trying to destroy) as many of the monuments as possible. 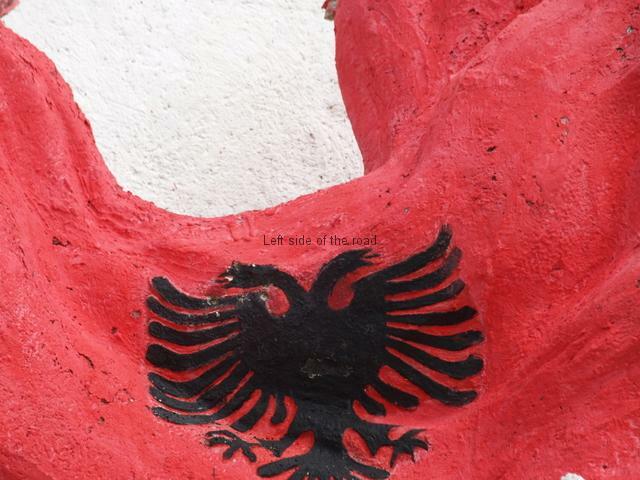 Their very existence is a reminder to all that at one time the people of Albania tried to build something new and different. Yes, some of the most impressive (as well as the simple inscribed stones) have been destroyed but many still exist. Yes, a number of them (if not all) are suffering due to neglect and are struggling against the ravages of time and the elements. 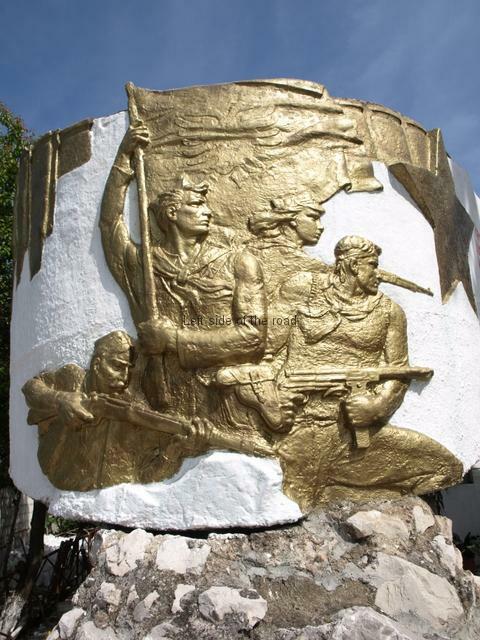 Yes, many are scared by the activities of the graffiti morons – even the 1912 Independence Monument in Vlora, a date which the reactionaries (and Social-Democrats) cling to in order to have a past to celebrate which doesn’t include a self-proclaimed king, foreign dominance and then years of Fascist occupation. Yes, in general, the local population doesn’t always consider the structures worthy of respect, for example, the lapidar in Priske seems to be the climbing frame for the local children, and bits of it are gradually disappearing as the slipping feet rub off another tiny layer of plaster. On the other hand there seems to be a trend developing to recover, restore and respect the past. Having talked to Vincent from the ALS I know he has reservations about some of the efforts at ‘restoration’ – and at times I would agree with him. However, at the present time, I would accept a bad but good intentioned restoration to neglect and vandalism. Another aspect of this approach of the past (which I have seen develop and grow over the few years experience I have had of the country) is that the story continues and there’s a recognition and acceptance of the political power and influence of such examples of Socialist Realist Art. Added to this is a widespread realisation that so-called ‘democracy’ has not delivered what it promised and the past is being viewed in a different way. Here it’s worthwhile mentioning, briefly, the monumental arch at Drashovice. This is monumental in many meanings of the word – and this seems to be accepted by the local population. There has obviously been a tacit agreement amongst the people of the locality that this piece of art is unique, something special and deserving of respect. On my couple of visits I haven’t noticed any damage to the many complex carvings and it hadn’t suffered any attacks by the spray cans. Even this ‘respect’ for the past is complicated. To just introduce another case here (I hope to go into more detail when discussing and describing the individual monuments) I’ll mention the simple artefact of the star – the Red Star that is an anathema to the reactionary. 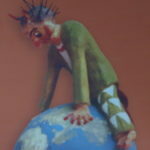 At times these stars on the sculptures are being highlighted at other times they are being painted out. Even the restoration is a battle and is making a political statement. For example, in the Saranda Martyrs’ Cemetery most of the red stars have been highlighted but not the star on flag and the one that would have been on the cap of the female partisan – the sign of being a Communist – has been obliterated. In the early 1990s the star was being removed from sculptures and buildings in the same way that it was removed from the national flag. (Some people may not be aware that the only difference between the flag of the Peoples’ Socialist Republic of Albania and that of the country now is the removal of the gold star above the heads of the double-headed, black eagle on a red background). I’m sure the reactionaries would have wanted to ditch that flag but then they would have had no past to cling on to as that banner was the standard under which the independence fighters of the 19th century marched and goes back even further to the time of the ‘national hero’, Skenderberg. So some of the monuments look different every time I go to see them. They may have been cleaned, painted or repaired. Or the opposite, they might have been removed (as was the bas-relief to a 1940 tobacco workers strike in Durres), even more decayed and neglected (as is the statue at the entrance to the Agricultural University at Kamez, on the outskirts of Tirana) or going on walkabout (such as the Five Heroes of Vig statue that is now somewhere in Shkoder – something is different each time I see, or read about, it). I don’t find that a problem. As stated above these works of art are part of a political battle and as in all battles there are casualties. And at the same time to be meaningful even Socialist Realist art has to develop. I’d prefer it to do so in a socialist society but if it happens in post-socialist societies it has to be accepted. The art was created for the people and if they don’t relate to it anymore than it is not serving its original function. What I see happening now in Albania is a realisation that in the ‘heady’ days of the 1990s they might have thrown the baby out with the bath water. I’m sure many believed that even as events were unfolding at the time. Pyramid schemes that robbed people of their meagre savings, a near civil war, the destruction of the infrastructure, the looting and destruction of factories, the wholesale privatisation of everything that once belonged to all the people, the emigration of an unsustainable number of workers due to the foregoing, the dissatisfaction with politicians of whatever hue and the almost universal hatred (but passive acceptance) of corruption are indications of such a change of thinking. But even in the period of socialist construction the fate of the works of art was not static, unchanging and there for all time. The aforementioned ‘Five Heroes of Vig’ statue was originally made of plaster, the one that exists now is larger, slightly different in what it depicts and is made of bronze. Quite a number of the Martyrs’ Cemeteries have changed their appearance over the years. The main one in Tirana also changed its location, moving from Tirana Park to a site overlooking the city on the Elbasan road. In some of those cemeteries the component parts have been re-arranged and now bear no resemblance to the original. One of the best examples of that is the Martyr’s Cemetery in Berove where truly radical changes have occurred (including separating the Partisan and Child from the original sculpture). 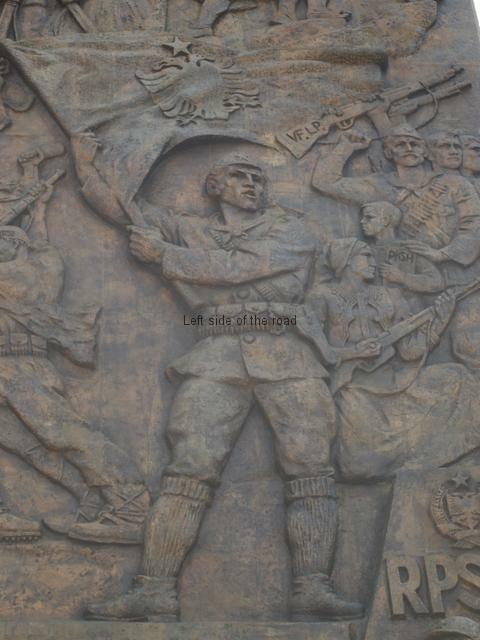 So change was part of the thinking in Albania when it came to Socialist Realist art as it was manifested in public sculpture. If the counter-revolution had not been successful it would have been necessary for the society to have had a look at the way the images were being depicted and questions asked if they could have been presented in a way that shows a true break from the old order. Although a revolution can change who governs and is in control of any society that does not mean to say that the old society still doesn’t have an influence in the way that people think and act. Those aspects of the old society will tend to hold sway, even on those who seek to place the old society in the dustbin of history. They might want to but some aspects of the past will be so deeply ingrained that it will be impossible for individuals to do so, however revolutionary they might consider themselves. Just to introduce the issue here (I hope to go into a more considered analysis in the future) I’ll make reference to the statue in the Martyrs’ Cemetery of Permet. 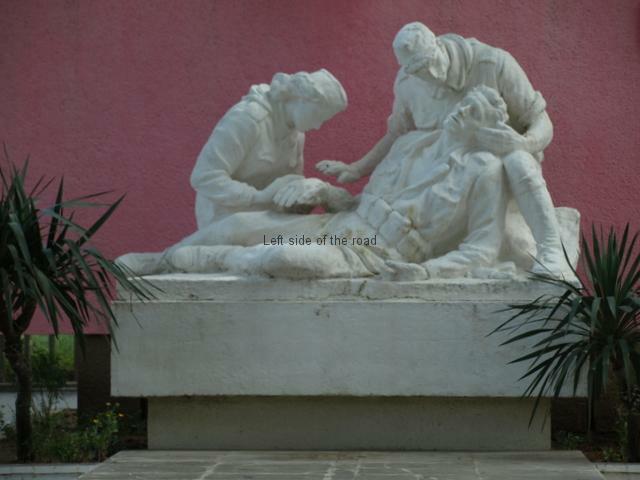 This is the work of Odhise Paskali and is called ‘Shoket’ (Comrades) and depicts an image that is reminiscent of works in Christian art of the ‘Pieta’ (where the Virgin Mary is depicted with the body of Christ after it had just been taken off the cross). There’s an article centred around this statue in Volume One of the ALS publications (pages 61-66). This is by some bourgeois ‘expert’ who uses the religious imagery as a stick to ‘beat’ an example of Socialist Realist Art (a not untypical sneering approach by so-called ‘intellectuals’). But if Albania had been able to maintain the Socialist Revolution for more than barely two generations it is very likely that such a debate would have to have been opened within the new society, with new ideas in a more sophisticated society devoid of superstition, ignorance and religious obscurantism. But this takes a long time. No Socialist society to date has had that time and luxury. To see how far things didn’t go in Albania in the 46 years of socialism you only have to look at the concept of the ‘dordolec’ and how that still has its pernicious grip on some people’s thinking. It was in seeking to challenge such outmoded and reactionary ideas of the past that the Cultural Revolution was carried through in both China and Albania. (The Chinese Cultural Revolution is too vast a topic to do anything more than mention it here but there’s an extensive, and growing, resource in scanned material available by going to the Banned Thought web page.) In Albania the Cultural Revolution was fought on many battlegrounds, one of the most important and fundamental was in the construction of the lapidars. As I continue to post material, both written and photographic, of these monumental sculptures, with their individual stories, I hope to explain what I see as an important advance in socialist culture represented by the work of many artists who had the chance to make a real contribution to the revolution. Often ‘intellectuals’ are a problem in a revolutionary movement (and even in Albania artists who had worked on some of the more impressive lapidars went their own individualistic way once they were free to peddle their petty bourgeois view of the world). A prime example of this is Agim Nebiu, one of the artists who created the vast mosaic on the façade of the National Historical Museum in Tirana, who vandalised his own work for the proverbial ‘thirty pieces of silver’ – see, that here, even I am victim of the past in which I have grown up and, unfortunately, the present in which I live. Perhaps in an age when capitalism and obscurantism is a thing of the past we will have a phrase that comes from the greedy and grubby parasites that were bought off by the privatisation of the assets of all for the benefit of a few? It will have to be a pithy phrase, though. The majority of the works that I’ll describe were created in the period 1966-76, which mirrored the period of the Cultural Revolution in China. During this period one of the aims was to elevate women to an equal role in society and to recognise the role they had played in the liberation of the country. Amongst other things this meant that often women are portrayed on monuments in a greater percentage then they would have in the actual war. And an important aspect here is that they were almost always armed – this would have been, and is now in an increasingly patriarchal society, like a red rag to a bull to the ‘traditionalists’. However, there was another period of construction in the early 1980s, at a time when little Socialist Albania was truly alone in a hostile world after the Chinese Revisionists had taken their country along the capitalist road. It’s certain I’ll make mistakes, both factual and in my analysis, of some (if not many) of these lapidars. But what I post will be based on the information I might have had at the time of writing. If anyone has information about a particular monument, can point to a location where I might be able to find more information, can correct any errors I might have made or can, for any reason, fill in the gaps, then please make a comment on the relevant post. I will be revising and correcting anything posted when new (or more accurate) information comes to light. As is Socialist Realist Art so will be my study of its Albanian manifestation – a living, changing and constantly developing project. This entry was posted in Albania, Monuments and Memorials, Socialist Realism and tagged albania, art, realism, realist, socialist by Michael. Bookmark the permalink. As a result of stumbling across your wonderful blog site, we are taking the boat from Corfu to Saranda this week to go to Boutrin. 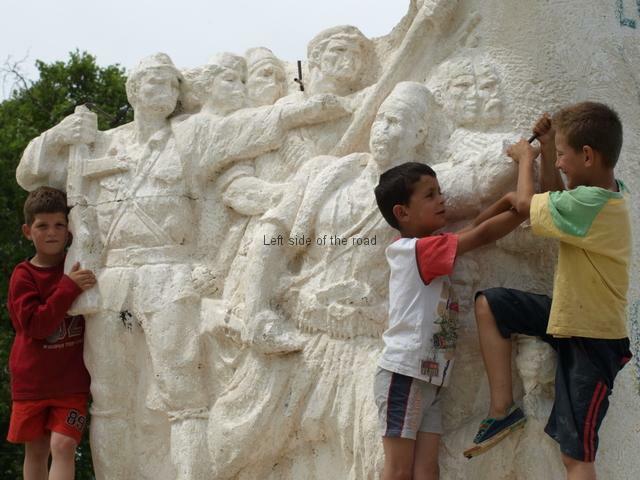 Can you tell us if there is any significant social realism art in Saranda? We will visit the martyrs’ cemetery in hopes. Glad to hear you find my posts on Socialist Realism in Albania interesting. 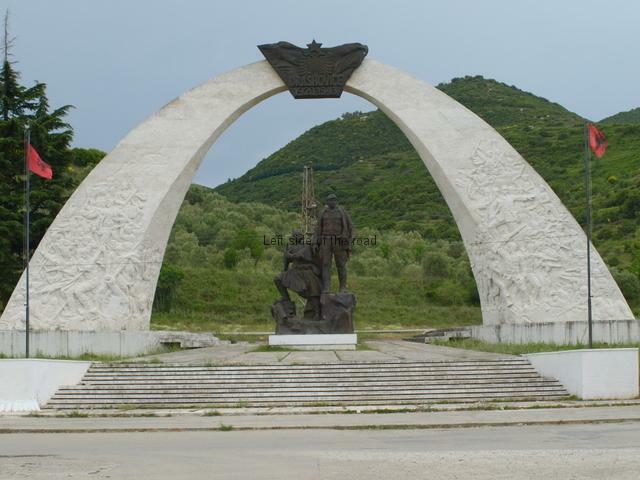 This is my post on the Saranda Martyr’s Cemetery. There’s another lapidar, at Manistir, which is at a low point in the hills, between the sea and the lake, about half way along the road from Saranda and Butrint. My post is here. All the recent development in the town of Saranda itself has left us with little. However, there’s a nice little sculpture of young girls picking oranges on the sea front promenade. This is between the port where you arrive on the hydrofoil and the small marina which you will see on the right hand side of the bay. You should be commended for your efforts. Socialist realism is completely denigrated in the West and I would imagine its Albanian variant would come under particularly strong criticism considering that the bourgeois and revisionist countries constantly inveighed against the “dogmatism,” “fanaticism” and whatnot of the Party of Labour.